Thirty five years ago my grandmother told me I could go up into her attic and take whatever I wanted. She said there wasn't much there but "some old junk", but if I wanted it I could have it. 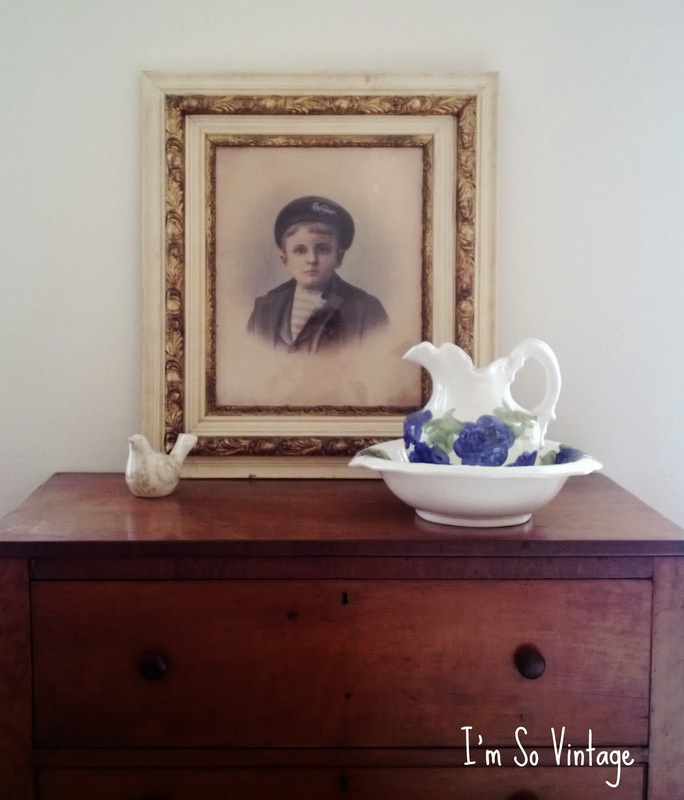 What she considered old junk was an attic full of family heirlooms. I took quite a few things, but left much more for my cousins. What I did take was part of what I had to put into storage. You can read how that turned out here. Before I left North Carolina a couple of weeks ago, I put a few things that weren't packed in boxes into my car to bring home with me. One thing I really wanted to have with me was this. 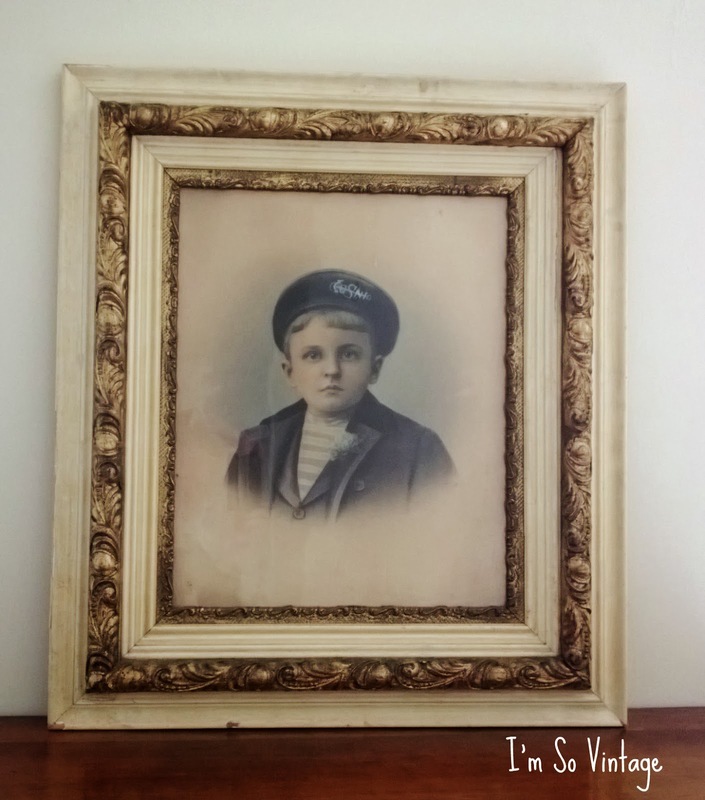 It is a large framed photograph of my great uncle Charlie when he was a child in the 1800's. Wasn't he a cutie in his sailor suit? I know it is Charlie, because after I got the picture I visited Uncle Charlie, my grandfather's brother, who was very old and bedridden. When Charlie saw the photo, he cried and said "that's me, that's Charlie". where he is sitting atop my grandmother's chest of drawers. The one that she refinished and made into a desk when my mother was a child. He is accompanied by a new little bird and an old pitcher and wash basin that I also had in storage. It's a simple vignette. Just the kind I like. Welcome home Uncle Charlie. It is so good to have you back. What a wonderful picture of Charlie. The frame is beautiful too. What a great picture and a family treasure. Glad you got that back! Aww ~ that's so sweet. This post brought tears to my eyes. I am glad that Charlie came home with you and I know that you have made your great uncle happy too. Oh my that picture is so priceless!!!!! What an adorable child in his sailor suit-you are a lucky lady to have taken it home. 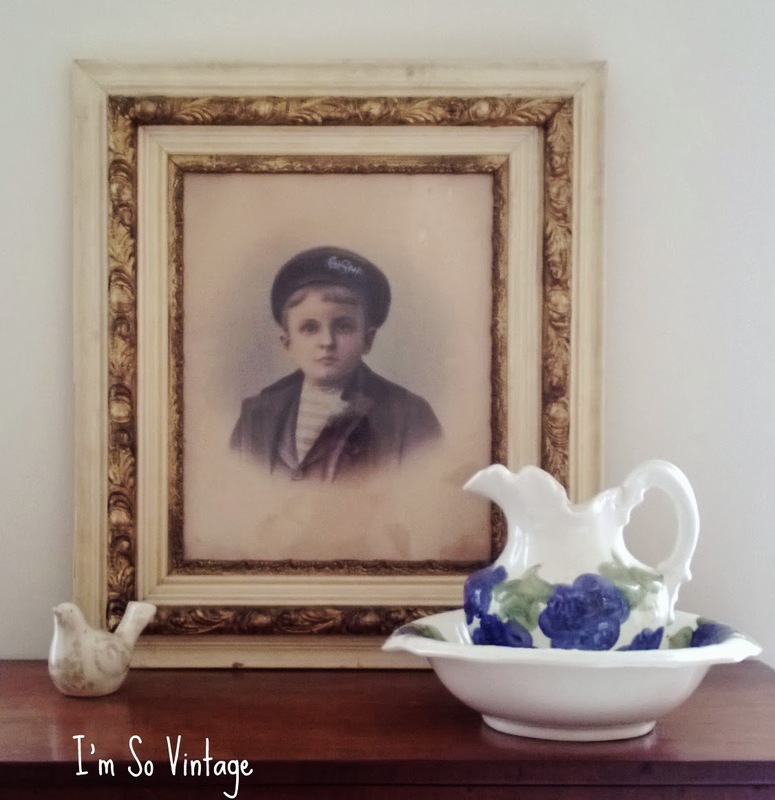 Love your grouping of cherished pieces! What a cute picture! 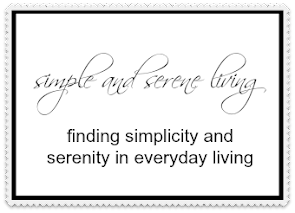 I'm so glad you were able to bring it home and use it along with some of your other treasures. It makes a lovely vignette. Love the picture of Uncle Charlie. It's perfect where you have it and what sweet memories it must hold. So glAd you have these memories back. Love the picture. I love the picture of Uncle Charlie and so glad he is home with you now. Have you moved yet? I'm so happy to hear that you did retrieve some family treasures tha weren't damaged. And I'm sure Uncle Charlie was delighted to finally be back with his family where he belongs. Arn't you lucky. It is usually the junk that carries lot of value and stories. I'm so happy that you finally have some of your precious treasures to enjoy. What an ordeal! Love your beautiful vignette my friend. So happy that you are able to enjoy some of your treasures after the long ordeal in retrieving them! What a treasure! I'm so glad you have him there with you. What a treasure to have your Uncle Charlie back home again! What a wonderful photo of Charlie! I'm sure he would be so pleased to see that you've hung on to it and placed it in your home. It's a wonderful picture! You must be so relieved to have these items full of memories back! Charlie is just adorable, how fortunate you were to be able to have some wonderful keepsakes! !